In the past, if you wanted a Weber Genesis Gas Grill, your choice was based on the color, whether or not you wanted a side burner, and a few minor cosmetic elements like having a stainless steel hood and doors. Now, this ever popular grill has a number of sizes, ranging from a small two-burner unit to the monster six-burner. Truthfully, the LX series of Genesis grills takes the line to a new high-end position. The Genesis II LX S-340 is a full feature grill. It has three main burners, a good quality side burner, and many accessories like a tank scale, illuminated control panel, and complete compatibility with Weber's iGrill 3 technology. With the latter, you can monitor cooking temperature and multiple food items at once. It also monitors fuel levels and remotely controls the lights in the control panel. 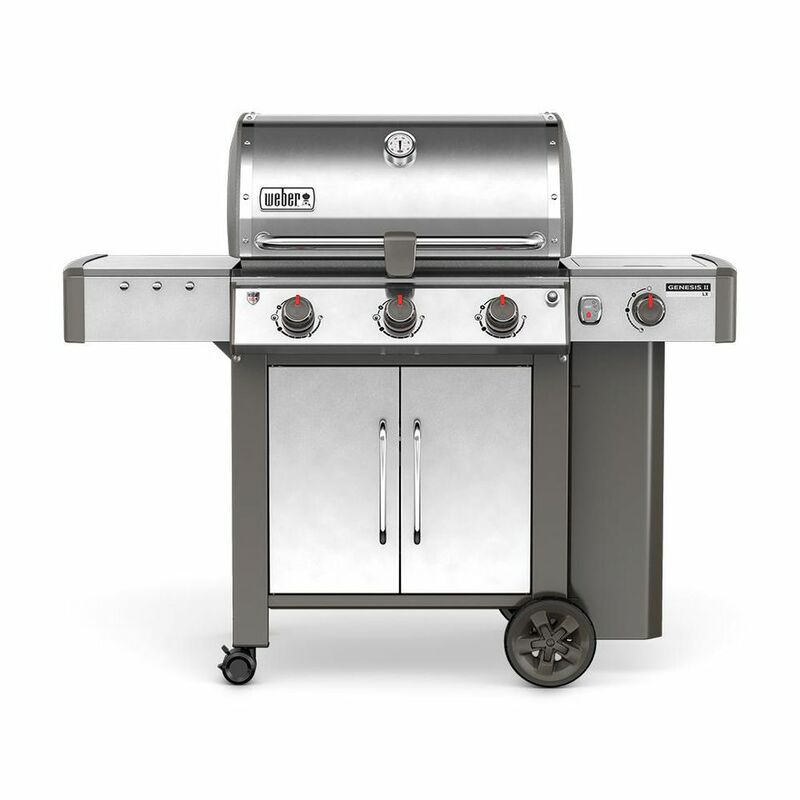 This large and simple gas grill has excellent construction quality and delivers on its many promises. It isn't just the variety of burners you can have, but there are two, four, and six burner versions available in this model. Rather, the entire cooking system has been redesigned. Most notably, the burners with the GS4 cooking system are new. In the past, the burners on a Weber gas grill were the typical stainless steel tubular burners. The new burners are rectangular, top ported, and tapered. With these new burners, the fire shoots directly up into the "flavorizer" bars and provides an even heat, front to back. The pressure inside the burner is the same all the way through, and the flames have the exact same pressure through every port. This gives the Genesis one of the most even heats of any gas grill on the market. Another innovation with the model is the new ignition system. Turn the control knobs on and the igniters continuously keep the burners lit. These igniters sit under a protective cuff that Weber confidently states will last for 10 years. In fact, they warranty the ignition system for so long that this grill gets the longest and most complete warranty in the industry. For anyone considering buying a grill, this is a critical feature beyond the technical aspects of the grill. Additionally, Weber's legendary support remains unchanged, and the warranty allows the rest of the industry to compete with its incredible reliability. For more than two decades, Weber Genesis Gas Grills, in all of their incarnations, have been at the top of sales lists and best product reviews. The one thing that's remained the same is the Genesis having three burners. Recent Weber Genesis series come in two, three, four, and six burner configurations. The deluxe version of the three burner model is a fully loaded and high-end grill. With completely redesigned burners, ignitors, and compatibility with the iGrill 3 Bluetooth temperature monitoring system, you can't go wrong. The only con with this series is the maximum heat output, which is comparatively low. However, there are many pros. First, there is solid construction of durable parts and there is the complete 10-year warranty in case anything goes wrong. With Weber support and very even heat, this would be perfect for a backyard barbecue or any other grilling needs. Is the Weber Genesis II E-410 Gas Grill Right For You?